In the next section of our CNA Skill Set Test Study Guide, we will be covering the procedures for measuring of a patient’s pulse. 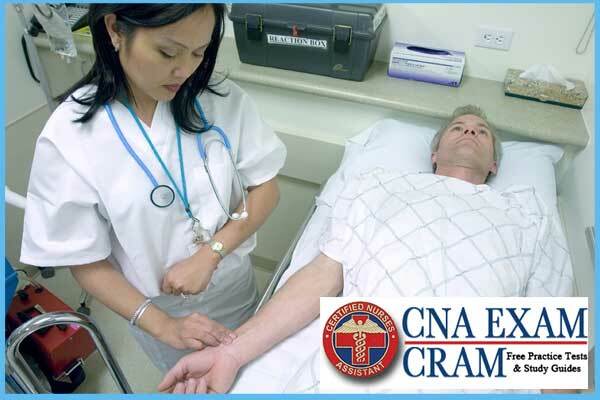 There are two ways in which a CNA can do this: Radial Pulse or Apical Pulse. The Radial Pulse method is measured on the patient’s wrist. This is the best method due to the ease of access and then lack of intrusion on the patient. However, if their wrist is inaccessible, or the reading is too faint, then you can use the Apical Pulse method. The apical pulse is measured on the patient’s chest near the 4.5 or 5th left intercostal space. The apical pulse method is actually the more reliable method of the two but requires pressure to be placed on the patient’s chest. Remember, just like all presentations, you should start your Critical Skills Test by introducing yourself to the patient, informing them of what you are about to do and wash your hands. Make sure the patient is comfortable, safe and sanitized at all times. IMPORTANT: This is actually one of the most failed skills sets on the Practical Test. Not because people forget the steps, but because their reading isn’t accurate enough. In most states, your reading must be within two beats of the actual number. If you use the 30 second rule, then if you miss more than 1 beat, you will fail. So, take your time and ensure you have the right count. Don’t believe us? Check the forums and many will confirm that this set is the worst! Ensure the resident is in the Supine or in a sitting position. If they are in the supine position, rest the arm along the side or fold it across their chest. If they are in a sitting position, ensure you support their arm or have it rest on a flat surface. Ensure the wrist is slightly extended. Then take two fingers and place them along the groove on the thumb side. Press down on the radial bone until you start to feel the pulse. Check to see what the strength of the pulse is first: pounding-bounding (+4), strong (+3), weak (+2), thread (+1), or non-existent (0). Now, for 30 seconds, count the pulse. Then multiply by 2. If the total is less than 50 or you find the pulse to be irregular, then count the pulse for 60 seconds. Now record the strength, rhythm and rate on your records. Ensure that the stethoscope is clean before using it. Place the resident in a sitting or supine position, making sure their chest and left side are accessible. Using two fingers, locate the apical pulse on the left chest wall at about the 4.5 to 5th left intercostal space. The key is to find where it is the strongest. Position the stethoscope at the 4.5-5th left intercostal space and count the beats for 30 seconds. Then multiply the beats by 2. Place the resident back into a comfortable position and clean your equipment.